Lynn Liverton of Kailua stood yesterday with four statues she created, each depicting a war the 25th Infantry has fought in. The Iraq war soldier in the middle is surrounded, clockwise, by the Vietnam, WWII and Korean war soldiers near Fernandez Hall at Schofield Barracks. A top Army officer with the Schofield Barracks troops in Iraq says "it is absolutely uncanny" how his soldiers have stayed focused on their mission despite three combat deaths in the last month. "It's tough. You're darn right it's tough, but the morale of these soldiers are absolutely amazing," said Brig. Gen. Mick Bednarek, deputy commanding general of the 25th Division. "They know they have a mission to do, and they continue to drive on to the task force mission and they never miss a beat." "Every loss is an incredible tough loss for the task force," said Bednarek, who talked to Honolulu reporters yesterday via a news video teleconference from his headquarters at Forward Operating Base Speicher in Tikrit. About 7,500 Schofield soldiers, many of them assigned to the 25th Division's 3rd Brigade Combat team, arrived in Iraq within the last month and a half. On Sept. 6, Pfc. Jeremy R. Shank, 18, of Jackson, Mo., was killed by enemy fire while on patrol. And last Saturday, Sgt. Velton Locklear III, 29, of Lacey, Wash., and Pfc. Kenneth E. Kincaid IV, 25, of Lilburn, Ga., were killed by a roadside bomb. Bednarek's videoconference was held just before the 25th Division unveiled the addition of three statues honoring Tropic Lightning soldiers who died in World War II and the Korean and Vietnam wars. The memorial, created by artist Lynn Liverton, is erected near the flagpole on Sills Field. 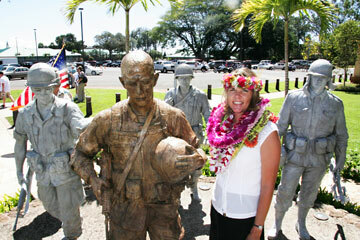 The statues unveiled yesterday join one dedicated in June 2005 to represent fallen Schofield Barracks soldiers from the Iraq and Afghanistan campaigns. The nearly 7,500 Schofield soldiers in Iraq now are part of Task Force Lightning, which is responsible for more than 47,000 square miles in the area known as Multinational Division North, an area the size of Pennsylvania. Maj. Gen. Benjamin Mixon, who commands the 25th Division, heads Task Force Lightning, which includes more than 20,000 U.S. soldiers plus four Iraq divisions and Iraqi army, police and border security elements. In all, the two-star Schofield Barracks general commands more than 130,000 people. Bednarek acknowledged that there are "a lot of challenges" facing the Schofield Barracks unit as it begins its year-long combat assignment. "It's a tough and hard, demanding mission," he said. "It's a very austere environment against a tough, adaptive and dangerous enemy that continue to hide in villages and towns." However, Bednarek said, progress has been made in developing the Iraqi army and police force and border security units. He cited as progress the willingness of the Iraqi police and soldiers to respond to recent suicide bombers. He added, "That's a huge success story. Clearly it's tough. Clearly they are making progress, but it's not all roses." The general said he was satisfied with the record of the 60,000 Iraqi police in his sector, whom the 25th Division is responsible to train. "Quite frankly, with the equipment they do have, and the vehicles, weapons and communications gear they do have, they are doing very well," he said. Bednarek said victory in Iraq would not be achieved by military means alone. "Clearly there is a political dimension, and part of the political dimension are the provisional reconstruction teams," he said. Their focus is governance and economics, and in northern Iraq, where the Schofield Barracks soldiers are now stationed, that means working on more than 500 civilian projects ranging from digging wells to rebuilding health clinics, Bednarek said. Agricultural projects in Diyala included helping Iraqi farmers and government officials nearly double their date crops, he added.